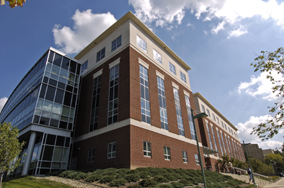 The primary goal of the Philosophy Department is to enhance and improve the intellectual quality of education of every undergraduate student at the University of Akron by developing their critical thinking, reasoning, and evaluative skills. These skills are necessary for success in every discipline and are of significant importance to each student's personal fulfillment and future success in any chosen occupation. The Philosophy Department consists of faculty offices, the main office (CAS 454), a lounge area for students (CAS 436), a private library (CAS 440), and two classrooms. The larger classroom (CAS 443) holds 40 students and accommodates a number of our introductory classes, such as Intro to Ethics, Intro to Philosophy, and Intro to Logic. The smaller classroom (CAS 438) holds 24 students and is typically used for our upper-level classes. The library is also used for department meetings and can be used for small seminar classes. The Philosophy Department is part of the Humanities Division of the Buchtel College of Arts and Sciences and is located on the 4th floor of the College of Arts & Sciences Building in room 454. CAS is on the southeast corner of College Street and Buchtel Avenue. Philosophy Club meetings are usually held once a month in the Philosophy Department's student lounge (CAS 436) on Tuesday evenings. Meetings begin at 5:00 PM and end around 6:30 PM. For more information, you can contact the club president at UOAPhilosophyClub@gmail.com, or go to Orgsync.